Wedding registries have evolved rapidly over the past few years — they're no longer just about starter necessities but also an expression of the couple's lifestyle and passions. Newer registry sites make it possible to add products and giftable experiences to one universal wish list, and they encourage group gifting by breaking down the cost of big-ticket items into smaller amounts. At the same time, the smart home trend, where everyday objects like thermostats and coffeemakers are connected to technology, is growing. From budget buys to splurges, and electronics to appliances, we've compiled the most innovative new products that newlyweds will want to register for (or gladly buy for themselves!). Goodbye, Siri — it’s been real. The newest leading lady in our lives is Alexa, and she’s bringing all of our Star Trek fantasies to life. Amazon Echo Dot’s ($50) female persona uses voice-recognition technology to execute commands like ordering takeout, checking the weather forecast, and streaming your favorite tunes. This gadget is also compatible with other smart home products so you can wirelessly control elements such as lighting and heat throughout different rooms without having to flick a switch. 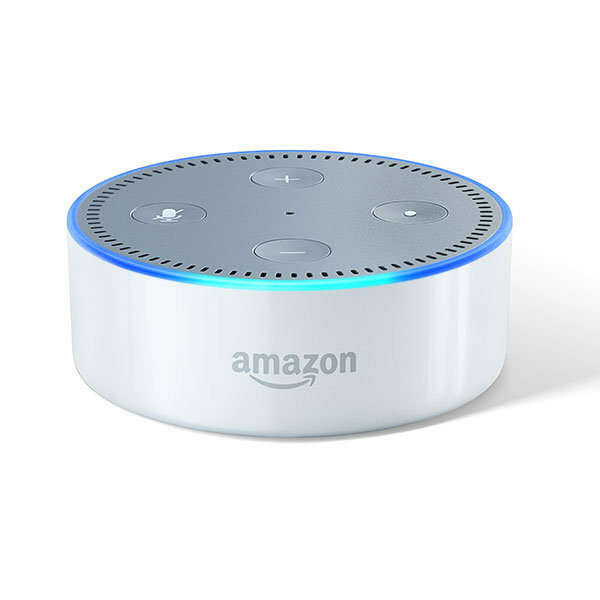 The Echo Dot features a faster processor than its previous model for half the price, and it's available in black or white. One of the easiest (and most inexpensive) ways to get your entertainment fix is Amazon's next generation Fire TV Stick ($40). It plugs into your TV's HDMI port and acts as a hub to over 250,000 TV episodes and movies that you can rent on demand. (Amazon Prime members can watch original programming like Transparent for free.) This streaming device includes access to the hottest apps — Netflix, Sling TV, Hulu, and more — as well as games, music, and live sports. The included remote is synced up with Alexa's voice-enabled technology so you can say things like, "skip past the opening credits of Game of Thrones" and "play The Walking Dead" without having to scroll through a huge list of content. Plus, you can use display mirroring to project all of those gorgeous honeymoon photos and videos from your smartphone to your TV. In addition to flying cars and time machines, a self-cleaning home is at the very top of our sci-fi gadget wish list. We can finally cross off that last item thanks to Roomba 980 ($899), iRobot's first cloud-connected robot. Newlyweds can use the accompanying app to activate cleaning mode from anywhere, at any time — multitasking has never been so gratifying. The Roomba 980 utilizes sensors and groundbreaking vSLAM technology (which stands for visual simultaneous localization and mapping) to map out room layouts, helping it clean more accurately. It's smart enough to adapt to different floor surfaces like carpeting automatically, and its low profile allows it to get in hard-to-reach areas where dirt is hiding. For a cleaning robot that's on a more affordable end of the spectrum, you can't beat the Braava ($199). Launched this past March, Roomba's first mopping robot works with wet, damp, and dry cleaning pads to tackle different floor areas. (Think of it as an automated, more supercharged version of the Swiffer WetJet.) It was designed with a square shape so that it can mop corners and expertly navigate around small spaces like the toilet, and the vibrating cleaning head helps to loosen dirt and stains. When you're done, place your Braava over the trash can and select the "eject" button to dispose of any gunk without having to touch it. Just don't blame us if "mopping" becomes your favorite chore. As you prepare for the next chapter of your lives, you'll want to have the right tools on hand to keep your home looking great so that you can spend less time doing chores and more quality time together. One must-have is the Bissell Crosswave ($249.99), which can vacuum and wash floors at the same time, delivering a deeper clean for far less effort. It's especially useful for newlyweds who have a combination of hard floors and area rugs throughout their apartment or house. Use the SmartClean fingertip controls to dispense the right amount of formula for whichever floor you're cleaning (ensuring that you don't over-dampen rugs). We also love that it's easy to maneuver and, unlike a traditional mop and bucket, the two-tank technology keeps the cleaning solution and dirty water separate, allowing for easy cleanup. The Nest Learning Thermostat ($249) stores your and your spouse's temperature preferences, automatically turning itself down when you're away. It learns your schedule as soon as three days after installation, so you don't need to adjust it manually with the change of seasons ever again. Most importantly, it cuts down heating bills around 10 to 12%, and cooling bills by as much as 15%. The third generation version of this product is compatible with Alexa. It includes new features such as Farsight (displaying the target temperature or time whenever it senses movement in the room) and Furnace Heads-Up (using diagnostics to give newlyweds notice about possible problems with their heating system). Prevent post-wedding weight gain and stay on track with your health goals using KitchenIQ's Smart Wireless Nutrition Scale ($59.99). Right off the bat, we knew this wasn't your average food scale, thanks to its easy-to-navigate touch screen. It uses a high-precision strain gauge sensor to weigh food, and it syncs with a free app to help you determine its nutritional value (calories, sodium, fat, carbs, and fiber). Not only does this intelligent scale assist with portion control, but it allows you to digitally keep track of food consumption over time so that you don't need to keep a manual food diary. You can view charts of your progress from week to week, or even compare year over year. It can be difficult to decide which kitchen appliances deserve a spot on your registry — do you spring for a pressure cooker or a slow cooker? And what about specialty items like a rice cooker or yogurt maker? With the Instant Pot Smart ($180), you get all of the above and more, helping you free up valuable cabinet space. This intelligent multi-cooker features 14 different auto-programmed settings, as well as customization options. It’s Bluetooth-capable so you can monitor the progress of your dish using the accompanying iOS/Android app. Unlike conventional single-function cookers, it automatically switches to the keep-warm function once your food is ready. You can keep it on that setting for up to 10 hours (a godsend when hosting parties). Coffee aficionados, enjoy barista-worthy java at home using the Behmor Connected Brewer ($249), equipped with WiFi. The accompanying app gives you an incredible amount of control over the brewing process, right down to the type of roast, water temperature, and a presoak option to enhance the flavors. Auto-schedule it so that you can get a caffeine boost when you need it the most, whether waking up or returning home from a long trip. The app will text you as soon as your coffee is ready. (Note: It's only capable of brewing six or eight cups, so you'll need to make big batches at a time.) Another big selling point is that all future firmware updates are handled through the app so you can take advantage of new-and-improved features without having to upgrade your machine. There are many health benefits of juicing, and it's a great way to consume more raw fruits and vegetables, especially those you wouldn't normally eat in a non-liquified form. The Hurom H-AA Slow Juicer in Rose Gold ($459) is our editors' pick because of its patented Slow Squeeze Technology — it rotates at a speed of just 43 revolutions per minute, ensuring that your juice retains all of its natural nutrients and stays fresh. It works much more quietly than other traditional juicers and blenders and comes with a handy lever that allows you and the Mr. to control how much pulp you want. Thanks to its beautiful rose gold hue and modern design, this is one appliance you'll gladly want to display on your countertop. Did we mention that it also has the capability for you to make (healthy-ish) ice cream at home? Total game-changer. The T-fal OptiGrill Plus ($179) is a one-of-a-kind indoor grill that will take your BBQ game to the next level. It draws fat and grease away from food, automatically adapts to the thickness of what you're cooking and even includes a frozen food function for defrosting. Best of all, it beeps when your meal has reached your desired temp (from rare to well-done), eliminating the need to babysit your meat. You can use the T-fal to cook everything from poultry to steak to fish to panini. The new "Plus" model makes it easier to grill fruits and vegetables as well, thanks to the enhanced manual setting. Unlike other indoor grills, the removable plates are a cinch to clean up. Take the guesswork out of making roasts, cakes, and more with the Range Smart Kitchen Thermometer ($49.95), which provides an ultra-accurate and quick reading, alerting your phone as soon as your meal is ready to go. Its heat-withstanding cord fits comfortably in your oven door so that you can check the temperature of your dish without constantly opening the oven. Choose from two different models: "Aqua" is geared towards stovetop cooking and baking because of its curved handle, while "Ember" is best for oven cooking since it includes a sharp tip to pierce meat (though you can technically use either for any food application). Ecstatic about the way a particular recipe turned out? Save the cooking details in the app so that you can replicate the results again next time. A hand mixer is a registry essential because it can perform a variety of different culinary tasks, from whipping up dreamy, creamy mashed potatoes to mixing decadent cake batter. The newly-launched Krups Digital Hand Mixer ($59.99) is a workhorse in the kitchen, with ten speeds and a turbo boost for tackling trickier ingredients. It's easy to switch between different speeds thanks to its fluid adjustment technology. Use the innovative count-up timer with pause function to keep track of how long you've been mixing or beating. Our favorite feature is the integrated sensor, which minimizes sensors and spills because it adjusts to the resistance of each particular mixture. The Krups mixer includes stainless steel beaters, two dough hooks, a pro whisk, and a storage case so you can pack everything up nicely. Reliable Velocity 200IR Compact Sensor Steam Iron ($169) is the Rolls-Royce of irons. This sophisticated device reduces time spent on ironing by as much as 50%. Launched in September, it utilizes patented continuous steam technology, heating it up incredibly quickly and preventing it from spitting up water (the bane of any frequent ironer's existence). Usually, ironing a stack of dress shirts involves sopping up leaks with a dish towel, but pleasantly, that isn't the case with this iron. It removes stubborn wrinkles with ease, and you can even use it on delicate fabrics like silk and wool. The handle features sensor touch technology, and the auto-bypass shut-off feature is useful when you have a staggering load of laundry to get done (which, let's face it, happens more often than we'd like). If you both love to travel and have lots of trips planned on the horizon, you’ll want to invest in quality luggage. The collapsible Barracuda Bag ($349) makes flying less of a hassle, and, dare we say it, fun again. It has an ergonomic swivel handle that prevents your wrists from cramping up as you lug it around the airport (or worst-case scenario, run to catch your flight in time). When your phone or tablet inevitably runs out of juice, the USB charger can recharge those devices up to five times on a single charge. And if you're forced to check your bag for whatever reason, it's equipped with proximity sensing technology so you can track its whereabouts using your phone. The Barracuda comes in an array of colors, including red, gold, black, blue, gray, and pink. Eight Sleep Tracker ($349) is a connected mattress cover that helps you get the most out of your Zzzs. It records fascinating data about how long the two of you were in light sleep vs. deep sleep, how many times you tossed around, your heart rates, and more. (Unlike other sleep trackers, there's no need to wear it or remember to charge it.) We are obsessed with the bed-warming function, which allows you to program each side as needed. There's nothing like coming home after an exhausting day and getting into bed to toasty sheets that you've auto-programmed from your phone hours before. You can also set the smart alarm so that it will wake you up during the lightest sleep cycle when you're naturally the most awake, resulting in a more pleasant experience. The only thing Eight can't do is prevent your partner from hogging the covers. If you’re not a morning person (raises hand), then there’s nothing worse than awakening to a blaring alarm or your spouse nudging you that you’ve accidentally overslept. The sleek and chic Beddi Intelligent Alarm Clock ($99) makes the rise-and-shine process more bearable, thanks to nifty features like a sunrise simulator that gradually brightens your bedroom and Spotify integration so you can jump out of bed to the playlist of your choice. Having trouble dozing off? The white noise function will have you snoozing in no time. Extras include multiple USB charging ports, a Bluetooth speaker, mood lighting, and smart buttons that trigger other high-tech home devices (e.g. Philips Hue Lights, Nest Thermostat). Your honeymoon will hopefully be the first of many adventures together. Capture magical moments like ziplining, visiting iconic museums, going on a safari tour, snorkeling, or just grabbing fruity cocktails by the pool (we won't judge) with the new GoPro HERO5 ($399.99). Dirt, sand, water, and snow are no match for this recording powerhouse, which is designed to withstand even the most action-packed activities and delivers professional-looking video and photography footage every time. The HERO5 model has great new features like auto-uploading footage to the cloud, advanced wind noise reduction, voice control commands, and more. Plus, you can preview and play back your shots, change settings, and trim your footage. More couples are requesting drones to capture unforgettable footage of their wedding festivities, and some are even going so far as to purchase their own. EHang's GHOSTDRONE 2.0 Aerial ($399) is one of our favorite mini drones that we've come across because it's easy even for non-techies to operate. It works with an app to mimic the movement of your smartphone — no transmitter required. The drone comes with a proprietary 4K camera to shoot professional-quality aerial photography and filming without any blurriness or shaking. With a fully charged battery, you can fly the drone up to 25 minutes, and it can reach speeds of up to 43 mph. It comes with a one-year warranty and is available in black or white. Bluetooth speakers are becoming more portable and outdoor-friendly. The Soundcast VG1 ($149.99) is a standout because of its excellent sound quality and impressive battery life: it features up to 15 hours of playback! Small enough to fit in your hand, you can bring it with you to the beach or use it by the pool without worrying about getting it wet (it's waterproof up to 10 feet). Activate Siri voice commands for hands-free control. For the ultimate audiophile experience, you can purchase two of these speakers and connect them through auto Bluetooth, creating a wireless stereo configuration. Pet parents, you never have to worry about rushing home to feed your fur baby ever again thanks to the SmartFeeder ($149). This connected device is controlled via Petnet's iOS app, and it ensures that your pup or cat is fed on a set schedule, whether you're home or not. It will dispense precise portions based on their age, weight, and level of activity. SmartFeeder will also provide feedback on whether or not they're eating the right amount of food, so you can help them stay healthy. Another useful feature is the food supply notification — newlyweds can keep track of when they're running low on pet food and have it delivered right to their doorstep. The gadget includes chew-resistant cables and a built-in rechargeable battery. Did you know that pollution can be up to five times worse inside your own home? Dyson's Pure Hot+Cool Link ($599) captures and removes 99.97% of potentially harmful particles from inside your abode, including mold, bacteria, pollen, fumes, pet dander, volatile organic compounds (emitted from cleaning products), and formaldehyde. The brainchild of 25 engineers, this machine monitors the air quality and keeps a history to oversee peak pollution times (making it a lifesaver for seasonal allergy sufferers). The Pure Hot+Cool Link is equipped with Air Multiplier technology, so it can be used as an effective year-round fan to either heat or cool a room. There aren't any fast-spinning blades, and it'll shut off automatically if tipped over. It's a big splurge, but we've never quite seen anything like it. Get your pearly whites in tip-top shape for the big day — and ensure they stay that way long after — with the Oral-B GENIUS Pro Electric Toothbrush with Bluetooth ($143.99). According to Oral-B's research, up to 80% of people spend insufficient time brushing at least one zone in their mouth. The brush features cutting-edge motion sensor technology to ensure that you clean every area of your mouth equally and evenly, and the accompanying app provides feedback in real time. If you're like me, and you tend to apply too much pressure, the brush will let you know when you're overdoing it by blinking with a red light and automatically slowing down the head speed to protect gums. Brushing your teeth for the dentist-approved two minutes has never been easier, and you'll never want to go back to a manual toothbrush again after you try it. It's no secret that wedding planning can be very stressful at times — meditation is an excellent way to cope, and it's been scientifically shown to reduce symptoms associated with stress and anxiety. Muse ($249.99) uses brainwave-sensing technology and an accompanying app to help take the guesswork out of meditating and make it more fun by providing real-time feedback. First, find a quiet place and put on the headband. Once you begin the exercise, you'll close your eyes and the app will simulate a peaceful outdoor setting, translating sensory data into sounds. When your mind is calm, you'll hear gentle ocean waves and birds, and if it starts to wander, the weather noises will become stronger so that you become more aware of your mental state. Whether you have five minutes or 45 to de-stress, Muse is an interactive way to find inner balance and track your progress.